You know that top in your closet that doesn't fit right? Or that dress you never wear anymore? Those items can finally be put to good use again in another woman's closet. It's time to cleanse your closet of the old and make way for something new. 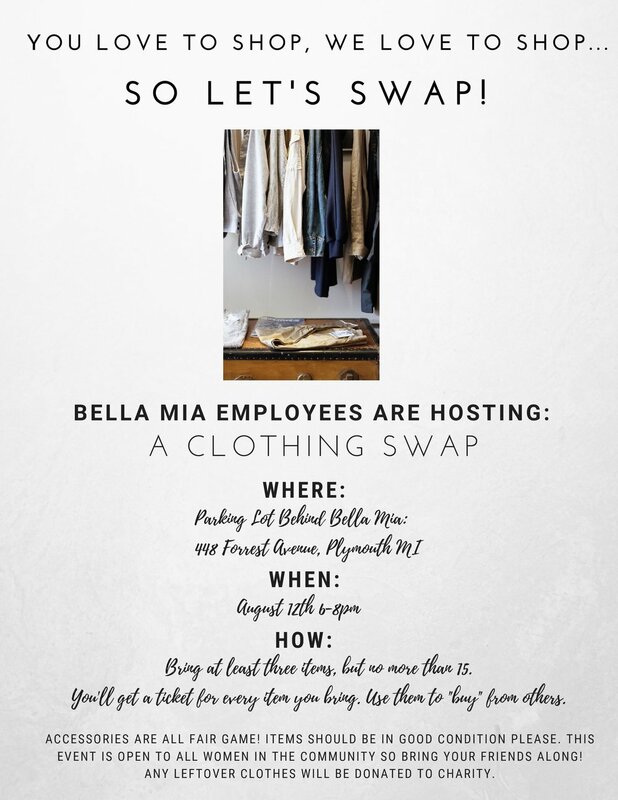 Bring your gently used, unwanted items to Bella Mia Boutique's first clothing swap on Sunday, August 12 from 6pm-8pm. Join other local women for this community wide clothing swap in the parking lot behind Bella Mia! Never been to a clothing swap? No worries- we have the deets! Bring at least three but no more than fifteen gently preloved items of women's clothing and accessories. That's right- clear out not only your clothing but also your jewelry, purses, hats, scarves, and shoes! For every item you bring, you'll receive a ticket to "purchase" other items! SO- you'll start with a minimum of three tickets and a maximum of fifteen tickets. Yes- that's right, you have the chance to get up to fifteen new to you items! It's economical! Swapping clothes is an easy way to stay on budget. That feeling you get when you clean our your closet and feel FRESH. Bring your girlfriends to make it a free and fun girls night out! Now that you're convinced- we'll see you there!